NuVet Plus is a Natural, Powerful Immune System Support that is recommended by Veterinarians and scientifically formulated to provide everything your dog needs for optimal health. My dogs' health is very important to me, and I'll bet you worry about your small dog's health too. I wanted to share a product I recently found that seems to be doing great things for my dogs. NuVet Plus is more than just puppy vitamins, it is an immune system builder. I am seeing some amazing results in my dogs’ health, coat, and energy level. Best of all, my finicky dogs love the taste. NuVet Plus is made with Real Chicken Liver. 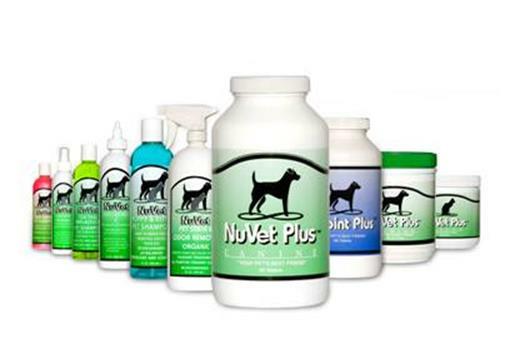 NuVet Labs puts out similar products for dogs and cats and you can purchase them in either powder form or as a wafer. But, do not take my word for it. Read on. You often don't think about the manufacturing process when evaluating products for your dog including dog food and this supplement. The way a product is made can make a tremendous difference in how many nutrients remain when the product is finished. This product is made in a FDA-registered human pharmaceutical laboratory. Dog foods and other supplements do not undergo such strict regulation making those products less nutritious and even vulnerable to contamination from toxins that can harm pets. Most dog food companies and pet products manufactures use pet grade ingredients and process them through heating which destroys many if not most of the nutrients. NuVet Labs® uses cold processing, which allows the ingredients to retain their rich nutrients and be absorbed easily into the digestive tract. Puppies and kittens, like children, require strong bones to support their active lifestyle. A new pup or kitten that can stand, jump and run must depend on their nutrition to give them a healthy skeletal structure. 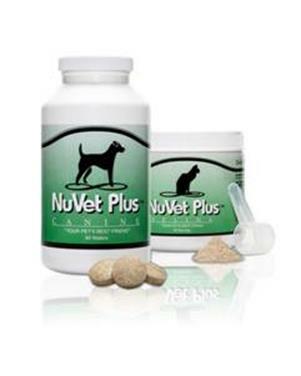 NuVet Plus® uses Oyster Shell which has the proper ratio of quality Calcium and Phosphorus for optimum absorption. Along with Magnesium, these are the vital elements for the structural framework of bones. NuVet Labs® knows a kitten and a puppy’s developing nervous system needs help to stay healthy which is why we make sure to include Vitamin B3 (Niacin) as part of our formula. B Vitamins are essential, and B3 promotes growth and proper functioning of their growing nerve network. Growing pets need real nutritional sources and one of the best comes from 100% Chicken Liver found in NuVet Plus®. Paddle dried to maintain full potency of its Omega Fatty Acids, Vitamins A, C and B Complex, NuVet Plus® provides essential nutrients to fuel red blood cells and make your pup’s or kitten's internal organs strong. Shih Tzu dog is eating a NuVet Plus wafer. For dogs less than 5 pounds, one-half wafer per day is all that they need. For all other dogs 6-100 pounds, the dosage is one wafer daily. Hundreds of thousands of dogs and cats are using this product to protect against most ailments (from back yard pesticides, pet food allergies and hormones, toxic formaldehyde in furniture and carpeting, ailments transmitted from dog parks and the vet’s office, and more), while maintaining a beautiful skin and coat. This is not just a vitamin. It is an immune system builder with a precise balance of vitamins, minerals, omega fatty acids, amino acids, and high-potency antioxidants. That is why it works so well through all three stages of a dog’s life. For puppies – It fills the immunity gap all puppies experience. Shortly after birth, maternal antibody effectiveness is greatly reduced. By 8 weeks, your puppy’s immune system is at a vulnerable point. Once in their new home, the immune system is weakened by the stress of adoption and exposure to new bacteria and viruses in their environment. This is also when the vaccine series is started. Vaccines are only effective if the immune system can respond properly. Starting your puppy off right is important to helping your puppy grow into a healthy adult. NuJoint Plus is another product that you might be interested in checking out.It is a hip and joint therapy product that can work for dogs of all ages. With so many small breed dogs prone to hip dysplasia, Legg Perthes Disease, or Patellar luxation, this product sounds like it might be just what we need. This Product is not available in stores or directly to the public.